They’ve got plenty of mutton. Just because one can write an opera based on a film, does this necessarily indicate that one should? While watching the North American premiere of Thomas Adès’ The Exterminating Angel at the Metropolitan Opera, I kept returning to this central question. The opera is based on Luis Buñuel’s film El ángel exterminador, a staple of the surrealist canon and a clear work of genius. Filmed in Mexico City, while Buñuel lived in exile, the film dryly satirizes the solipsism and superficiality of the upper classes. Critics have often tried to piece together the film’s enigmatic symbols, applying psychoanalytical and political hermeneutics in order to make sense of Buñuel’s perplexing vision—especially within the context of the period after the Spanish Civil War, during the dictatorship of Franco. However, in interviews Buñuel claimed that, as is true in life, there is no sense to be made of his work. While Buñuel may have denied that the film held any latent, symbolic coherence, the plot is rife with allegory and existential dread. In the film, Edmundo de Nóbile and his wife Lucia host a lavish supper party, inviting several members of the upper class. As the guests arrive, many of the house servants inexplicably flee the premises. And when the party concludes, the guests find, for some reason, they can’t leave the music parlor. They eventually decide to spend the night. While their inability to depart the room baffles the guests, they cannot bring themselves to do anything about it. Meanwhile, those outside the house are unable to get in, for, seemingly, the same mystifying reason. As the party guests languish under their lethargy, hunger, thirst, boredom, illness, and fear, Buñuel moves further into a surrealist mode, conjuring a phantasmagoria of odd, supernatural, and politically potent symbols. 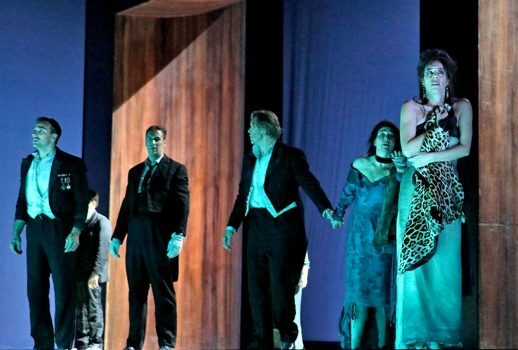 The operatic version by Adès was a success in Salzburg, where it premiered in 2016. However, while watching the opera last night, I kept coming back to that same ontological question—why should this text be adapted into an opera in the first place? What does it do that Buñuel has not already done with these ideas, this setting, and these characters? In short: what’s the point? My mother is an art historian and—I suppose I can come out and say it—the expert on Dalí and photomontage Surrealism in general. She did the biggest exhibition on Dalí there’s ever been, in Venice. She knew him. I used to watch Buñuel films when I was thirteen, fourteen, because of my mother. Surrealism is something that was literally in the house all the time, in a huge way. It was the sort of art that I knew best, the whole world of that—Magritte, Max Ernst. So Buñuel, naturally, that sort of fantasy, played very dry, always appealed to me. It was an odd taste for a fourteen-year-old. Adès seems self-satisfied with his adolescent precociousness—his attraction to this difficult genre of art, his access to it, even at a young age. And the early, familial bond he experienced as a fan of Buñuel accounts for his choice of El ángel exterminador as a source text. But, just because you admire something doesn’t mean you have special permission to intervene on its behalf, to re-articulate it according to your interests and desires. Within the operatic canon, one immediately thinks of Verdi’s engagement with Shakespeare, and his uncanny ability to flesh out the more lyrical moments of the original text through music. Verdi justifies his intervention by the way he transforms and deepens the source material. Adès’ adaptation does not demonstrate a similar artistic practice. For the love of El ángel exterminador, he should have left it alone—the film doesn’t need an artistic intervention. Buñuel did better than Adès ever could. To be clear, Adès’ composition is meticulously worked out and relatively coherent. It keeps one’s attention; it’s slightly confrontational—at times almost beautiful, but also tedious and predictable—indistinct from much of the 20th and 21st century operas endeavoring to be modern. Buñuel’s flat, almost banal dialogue has a subtle, black humor at its core; Adès’ score eschews this manner in favor of a ponderous, self-important expressionism. This approach is not without merit—in performance, the score was often frightening, even hair-raising. For example, during the short interlude between Act I and Act II, there was a spine-tingling barrage of percussion. Also the ending of the opera was downright horrifying, with a brassy, manic wall of sound suggesting apocalyptic dimensions. However, this heavy-handed musical gesture paled in comparison to Buñuel’s original, slyly cruel ending for the film: innocent lambs trotting serenely toward a church to the sounds of gunfire and riot. Buñuel’s fantastic image and sound completely overshadows Adès’ imprecise intervention. O sheep, why dost thou leave me? Regarding the production by Tom Cairns, who co-wrote the libretto with the aid of the composer, there really is no intervention to write about. A few scenes and characters have been excised in the libretto, but the direction, including the sets and costumes (by Hildegard Bechtler), mimicked the original film so succinctly that it was eerie to watch—one felt inadvertently caught up in the existential loop the opera endeavors to enact. The cast, as an ensemble, was most notable for its endurance. The same can be said of the orchestra as well, conducted last night with exuberance by the composer. While there are measures of tonality and ease that punctuate the oppressive dourness Adès has drawn over the narrative, the score’s most striking quality is the challenge it presents to its performers. This is especially true of the role of Leticia, the opera singer. The role was sung with breathtaking bravura by Audrey Luna, who previously tackled the assignment at the world premiere at the Salzburg Festival and at Covent Garden. Leticia’s stratospheric tessitura recalls another Adès creation, Ariel from The Tempest, a part Luna sang at the Met in 2012. 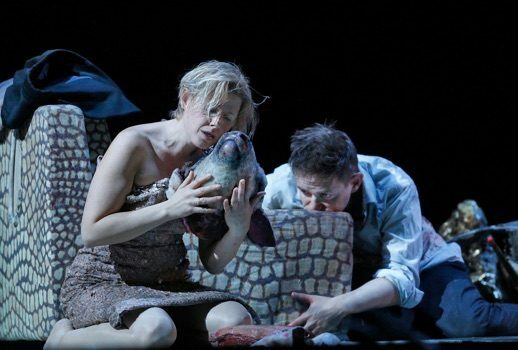 However, while Adès’ stratospheric scoring made sense for Ariel (fairy, spirit, air), it seemed superfluous with Leticia—all that dog-whistling did nothing to reveal her character, nor did it illuminate her function within the opera. There were other fine performances, worth mentioning here as well. Alice Coote, as Leonora Palma, sung an erratic vocal line with a controlled mezzo-soprano, imbuing her character with gusto and complexity. Sophie Bevan and Sally Matthews both managed to draw out the more lyrically beautiful elements of the score as Silvia and Beatriz. Frédéric Antoun, Rod Gilfry, Iestyn Davies and David Portillo all deserve credit for acquitting themselves with dignity and grace. However, as Doctor Carlos Conde, Sir John Tomlinson blustered and wobbled his way through a role that seems to call for finesse and gravity. While his august reputation precedes him, he was terribly miscast. One final point: the whole project was rendered slightly sour by its epistemological context. In the opening scene of the opera, as in the film, there was a repetition of the party’s arrival; the characters repeated their dialogue and blocking, foreshadowing the nauseating loop into which they eventually descended. The production at the Met enacted this reiteration through lowering and raising the famous house chandeliers twice. This gimmick, disorienting to say the least (at first I thought there was some technical glitch), located the target for the evening’s satire within the house’s plush red seats. I’m not saying that audiences are beyond the purview of an artist’s criticism. However, to satirize people who paid up to $300.00 for this event—not to mention the members of the economic elite who make up the Met’s board of directors—seems both self-aggrandizing and willfully unaware of the systems that made the performance possible in the first place.